In addition to the perfect pair, the desk & chair, I’ve stumbled across this little delight. 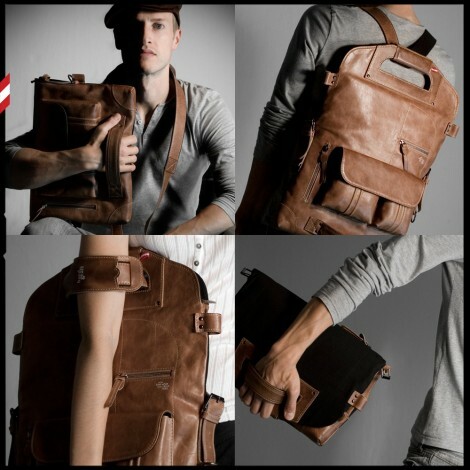 It’s Hard Graft’s 2Unfold laptop bag. 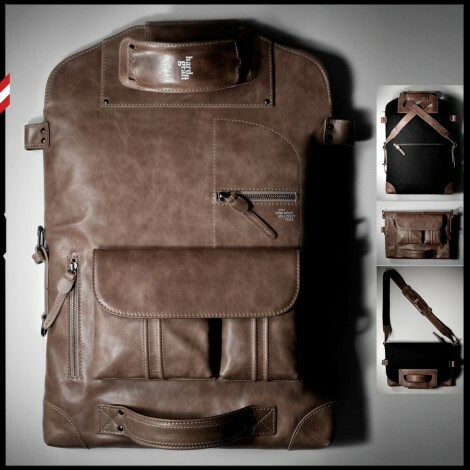 The great thing about this Italian leather bag is that it can easily be flipped and switched into 8 different types of bag to incorporate either a 17″ or a 13″ laptop. Gorgeous. Such a nice chill out song. Check out Alain Clark on Youtube. Well, in it’s first day I’ve gained close to 40 fans. Pretty happy but I want more. I want to build a community around a single website as this IS the key to a website’s success. I also made another page for a website I’m planning on creating called MyDadSaid.com but what I’m doing differently is I’m building the community first before I introduce the website, which will then start being used by many people from the launch. The gist of MyDadSaid.com is that random people can come on the site and post the things that their dad says. I mean, we all have dads that offer some funny, but to them serious advice, or come out with just plain nonsense. People can then which can vote whether or not they like the quotes or something similar, but I haven’t thought that far ahead into it yet. Would be a fun little website to have. Apart from that, nothing much new. Still thinking, still dreaming. If like me, you absolutely hate wires then the Bluelounge StudioDesk ($600) is the desk for you. It’s absolutely stunning. But what is a desk without a chair? 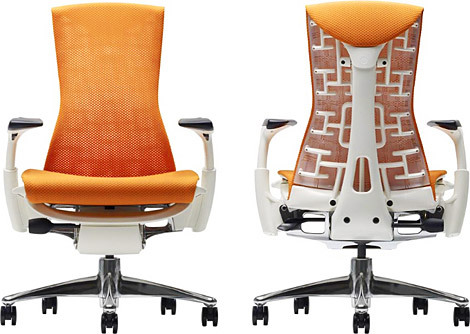 The Herman Miller Embody Chair ($1,600) to be precise. “The Embody allows for a crazy amount of tweaking and adjusting. Besides the standard movements, one pretty innovative feature is the adjustable seat depth. Any office chair has adjustable height. 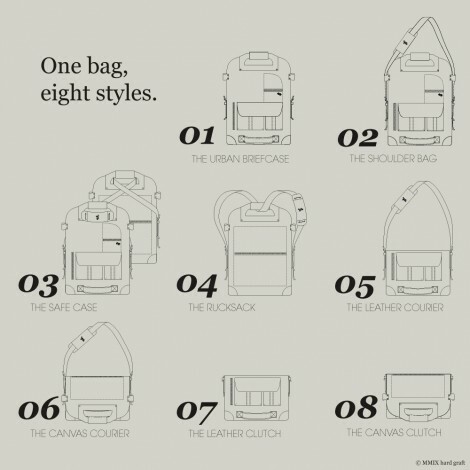 But the Embody’s seat actually gets bigger (front to back) with a tug of two handles up front. In addition, the armrests have a terrific amount of width adjustment, allowing chubby and skinny geeks alike a perfect fit.” – Uncrate. Here are some images of the luscious furniture pieces. Is is just me, or does this seem massively pointless? Okay, so I understand that people may want to update their status, that’s not the problem. It’s texting Facebook to send a message to your friend so you have to wait for them to get in, check their Facebook then reply to your message which you get once you check yours. Here’s a million dollar idea; Why don’t you just text them directly? After some discussion with a representative from Capcom, the company that brings you video games such as Dead Rising (Xbox 360), Resident Evil (Wii), and Monster Hunter (PSP), we have come to a decision to hold a little competition on The Cheese Grater. When: I’ll let you know when I do. Why: As a promotion for their new game that I previously mentioned, Monster Hunter for PSP. Prizes: Limited edition Monster Hunter T-Shirts and Monster Hunter PSP Games. The gist of the discussion was on what type of competition to hold. We thought of a couple, but I want to know what you think. That’s right. You. Leave me a comment and if your idea is used I’ll give credit to you on the competition post as well as put a link to your blog/website. 3. 2. 1. GO GO GO GO! 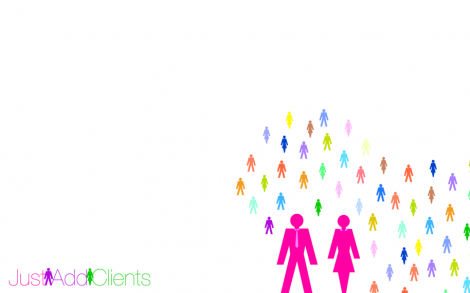 The Moneymaker – Just Add Clients. I think my friend and I are onto a winner here. We’ve decided to set up our own company utilising the skills we already have and the ones we are learning. I won’t give too much of the game away yet as we are still discussing the business plan but I will leave you with a glimpse into the company branding. Well, 4 days into my summer holiday, pretty good when something is happening, boring when not but I can’t help but feel I’ve already wasted the whole summer, don’t know why? I probably just need to get out more! On another note (the main note of this post), I got an email today from the company who supply the ads for TheCheeseGrater.co.uk asking for a Media Pack. I just thought it was a pack of promotional goodies that I send out to companies for potential investment and such, but in this case it was a simple PDF of details on the website statistics and pricing for adverts to be placed on the site as well as some additional information. I checked out a few on the internet as I was a bit unsure as to what they actually contained and they were pretty long, average 10-12 pages. They were so BORING. Who has time to read all of that? Well, mine was only 5 pages. Nice, simple, straight forward and to the point. The way I saw it is that if I supply the key information (such as visitor stats etc.) and a little about the website they’ll have enough information to decide whether or not they like what they’re reading. The previous ones I saw had so much clutter on the page, I felt like I had ADD reading it, jumping around the page like a Mexican jumping bean! I used quite a cheeky tone of voice it because it goes with the website and I think that helped me get away with it being so short. Time will tell I suppose. If people keep coming to me, then I know it must be working if not, then I’ll review it. Next on the agenda for summer – to start freelancing again, unless I get a temp Summer job in an agency of course. D&AD – New Blood: The Pledge. 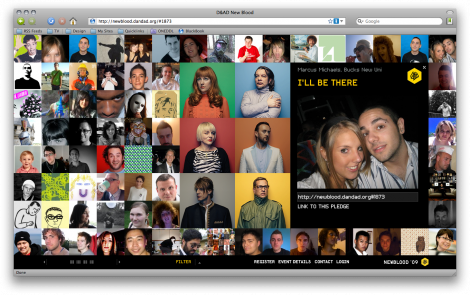 Sign up to D&AD, upload a photo or a video for your pledge to be there at the New Blood Exhibit. Tickets are free (just print them off) so there really is no reason not to go. Just click the image below to be taken to their website. I find myself empty for thought recently on what to write about. I would say that it’s because I’ve been busy, and to a certain extent I have (sort of). I’ve recently got into a series called Breaking Bad that has gripped me from the first episode forcing me to watch both seasons (19 50 minute episodes) in their entirety in a mere 3 days. On another note, I’ve been thinking about a business card. More of a business coin actually. A suitably sized, silver/gold coloured, engraved coin. It will not fit in a business card holder, it will however, fit into the change compartment in a wallet/purse. Business cards can tear, rip, get damaged by water. Coins are much more durable. Picture this: You’re walking down the street, it’s a nice summer day, you’re taking your time and enjoying the weather. You glance down and see a bit of cardboard upside down, possibly damaged by the rain or people walking over it. Most likely, you’ll pass it by. Now, same scenario but with a coin. Money maybe? You’re curious, you pick it up. What next? If you keep it, then you’re a potential customer, if you throw it back on the floor you’ve given someone else the opportunity to pick it up. So that, and some other thought over the matter led me to research about investing in a small batch of business coins. Done properly, they would look very, very nice.